Once again, much talent, both professional and amateur, was on display. Whitman Field opened the show. He danced a Cha-cha/Hustle with Amy Reichert. Vernon "Architect of Dreams" Duckett then danced a smooth Foxtrot with Michelle Officer. Debbie Feldstein danced a Viennese Waltz/Quickstep with Alex Tchassov. When you dance slowly, you need to dance in between each step, so in some ways, dancing slowly is more difficult than dancing quickly. At a previous showcase, Cynthia Miller and Joe Woo (teacher: Yuliya Leviten) demonstrated their mastery of fast dance with a Samba. This time they showed they are just as good at slow dance with an International Rumba. Lori Brizzi performed a sizzling West Coast Swing with her partner Manuel. The routine included a blinding pair of gold pants, and some amazing transformations that can only be properly described by a professional mathematician. Lori then got right back up and taught a Merengue Rueda. Nearly everyone at the showcase participated, guests and performers alike. The routine she taught used three simple moves to create two levels of common space. As in Salsa Rueda, the routine allowed everyone to dance with everyone else in the room. This was very generous of Lori since it meant that all of the other women got to dance with Manuel. Robert Abrams and Michelle Officer led off Act II with an American Tango. Walter Levy and his partner Raluca danced a Hustle Adagio. Hustle is usually brassy and athletic. Walter and Raluca managed to make Hustle lyrical Â­ almost Waltz-like. Dragan Ranitovicís performance class (Jim and Liz Capazzi, Jim Tomlinson, and Kaye) demonstrated a Viennese Waltz. Rob Burby and Anya made their professional debut with an International Cha-cha. Anya wore a red dress of simple elegance. With no artificial enhancement (in other words, no sequins), they set the room ablaze. Following a Swing class, Dragan and Kaye led off Act III with a Waltz. 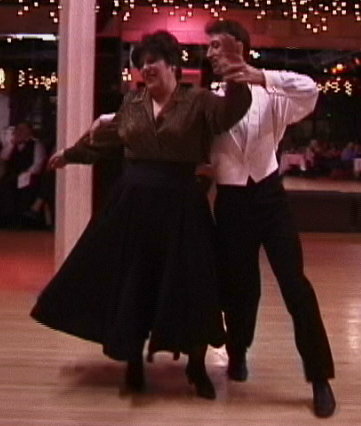 Patricia Reynolds and Henry Biglin (teacher: Aleksandra Gisher) made their amateur debut with a Cha-cha. They danced with both style and strength. Christian Perry, Miyuki Sakurai and friends (Yumiko Moriyama, Kayo Higuchi, Emiko Sadakata and Kumiko Arai) performed a swing and tap routine. You know Christian and Miyuki are good because they managed to make that Lindy Hop chicken peck move look smooth. Rob and Anya closed the show with an impassioned International Rumba. There was plenty of general dancing until late in the evening. All in all, it was a great show with an enthusiastic and vocal audience.